Olde Ireland/Éire Ársa is an Irish craft design, manufacturing and distribution enterprise. 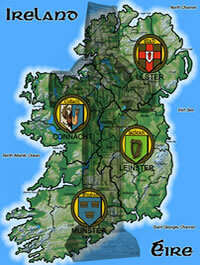 Established in late 2010, we are an Irish enterprise based in Galway city on Ireland’s west coast. Using quality natural materials like stone, slate, wood, glass and cork we design and manufacture premium Irish Historical and Heritage Products. Employing state of the art technologies like lasers plus old fashioned traditional craftsmanship, all our manufactured products are custom-made and are based on events in Irish history and heritage from at least 100 years ago or more. Our initial product list (below) extends from reproducing old Irish large scale Ordnance Survey maps, Ireland’s old railway network, old Irish black and white photographs, Irish census records of 1901 and 1911, Ireland’s old patriots, Ireland’s celebrated writers and poets and many others. All of the above can be beautifully reproduced on a range of old natural materials, like old salvaged/reclaimed roof slates from 100 years ago. As such Olde Ireland / Éire Ársa products make the most unique and beautiful keepsakes and gifts, an antique product that will become a prized and valued heirloom for passing onto future generations. Preparing our base materials is an integral part of our manufacturing process. To learn more on how we do this, like how we reclaim old roof slate please see our natural materials page. We encourage you to send us your comments on our product range. If you would like to order any Olde Ireland / Éire Ársa Products or if you have any related queries please contact us. Our terms of trade on all sales include a 50% deposit at time of order and the balance paid on delivery, we accept all major credit cards. Upon receipt of your query/order we will acknowledge your order and advise you of delivery times.